Pollok are delighted to confirm that three players have extended their contracts until the end of next season. Summer acquisitions Danny Boyle and Danny MacKenzie are joined by recent signing Jamie Henry in agreeing terms for season 2019-20. Danny Boyle has made 25 appearances in a Lok shirt, only missing one game, since his move from Rob Roy. 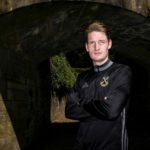 His counterpart MacKenzie has featured 16 times for Pollok scoring two goals. Former Aberdeen youth captain Jamie Henry joined the club at the tail end of last year and has made 7 appearances so far in the Lok midfield. Earlier this month the club released striker David Gormley to allow him to sign for amateur side Nico’s. Aaron Millar also departed the club at the end of his loan period from Clyde. Once again, we’d like to wish both players well for the future.